A true photographic image of Joseph Smith Jr.: What did Joseph really look like? The only known 2nd generation unedited photographic print copied from the original daguerreotype of Joseph Smith Jr.. The original image was taken sometime between 1840 and 1844. This blog is the journey of my discovery and research over the last two years. What did Joseph really look like? Even though I love black and white photos, I wondered what a colorized version of the unedited photo would look like. Here is my colorized and digitally painted artistic rendition. Below is a copy of the Unedited Photo of Joseph Smith, however I did do some editing for this copy such as upping the contrast, sharpening the details, a slight trim on the top to fit a more standard size print frame and of course the addition of lettering. 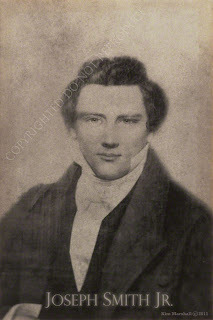 Joseph Smith Junior copied from his daguerreotype. It was a very interesting process working in Photoshop, I found so many more hidden details in the unedited photograph. Each time I would approach a new section of the picture, I would find something new I hadn't seen before. 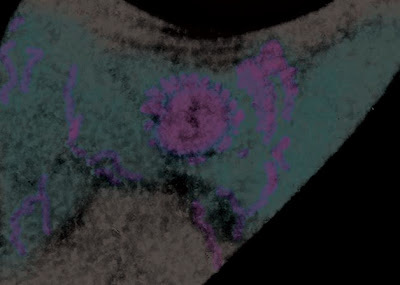 It was quite exciting even though it was a very tedious and complex process reworking the colorized image. I didn't just want the standard black and white photo with flesh tone applied. I felt like I had to rely on my artistic skills to bring him to life the best I could, not with oil paint but with pixels. 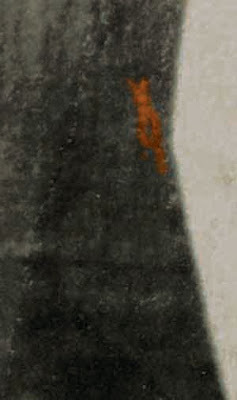 While the 2nd generation photo of Joseph has more details than any other image, unfortunately, certain particulars are only partially visible and others completely lost because of the daguerreotype reflection and paper stippling. For instance, only the top of his watch fob is visible but the direction of the chain quickly disappears. 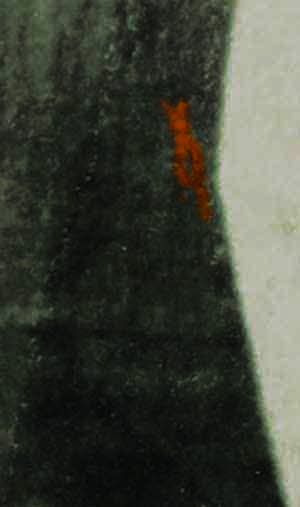 Note the orange highlighted beginning of what appears to be a watch fob. What I thought was a filigree "S"cravat pin in gold, actually appears to be an embroidered "S" button embellishment. Once I found the small ribbon edge around the octagon medallion, I suddenly could see the ruffled edges of what appeared to be lace on his cravat. With the contrast amped up I added a few highlights to direct the eyes to the button and ruffles. Next, what I thought was a button on his vest, was not just a button but possibly a military insignia with a star above it. I wondered if there was possible a ribbon attached to it, but without certainty I did not add it. I searched the internet for pictures of his Lieutenant General insignia but could only find tiny artist renditions of it. They did appear similar but nothing exact. If anyone knows anything more about this metal, please let me know. 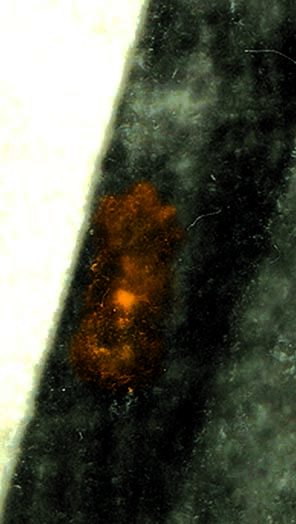 Last, was the discovery of what appears to be an embroidered ribbon, perhaps a black mourning ribbon. I wondered if it was just a pattern in the fabric that was on the lapel of the jacket but the light shadow under the bow makes me believe it is sitting on top of the fabric but stitched in . The ornamental edging of the button hole appears to be tied into the design. Again, if anyone knows more about Joseph's clothing and can identify anything I have posted, please let me know @ josephsmithjr2009@hotmail.com. P.S. I just have to add one more thing. Again, none of these tiny, tiny details show up in any of the artwork (i.e. RLDS painting) of Joseph. The Library of Congress edited albumen print of Joseph does show a faint indication of a fob and button. Proof these two images are tied together. 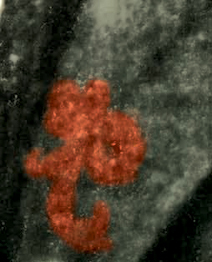 Leave it to a micro-scanner and digital files that can have the contrast/lighting worked with to bring out these hidden treasures. Photo #5 (which you suggest is a military insignia) actually looks to me like it might be a Masonic compass-and-square. He looks like me. Place the death mask on my face but here there is more. He looks like King Solomon, Apostle Matthew, Ares God of war and ArchAngel Michael as this is who we are. We live many lives and these are some examples of the past lives we have lived. $14.99 plus $5.00 shipping- High quality print is printed on 8.5"x11" 70lb.Canon Photo Paper in Canon Photo Ink. Hang from white border or trim to fit an 8"x10" picture frame with glass. Buy 4"x6" Print Copy of Joseph Smith Jr. Photo in Black and White. $9.99 plus $5.00 shipping-High quality print is printed on 4"x6" 56 lb.Glossy Canon Photo Paper in Canon Photo Ink. Print has small white border. $24.99 plus $5.00 shipping-High quality prints are printed on Glossy Canon Photo Paper, in Canon Photo Ink. 8"x10" is printed on 8.5"x11" paper and has a white border. 4"x6" prints has small white border. 8"x10" Colorized Artistic Version of Joseph Smith Jr. Photo. 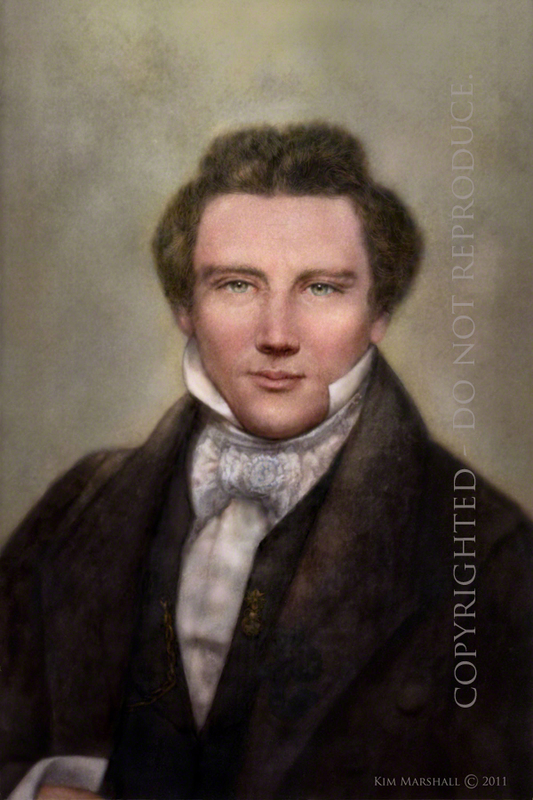 *All Black and White Joseph Smith Jr. Photo Prints come with "Joseph Smith Jr" in white print on bottom of photo. Photo may not be copied or reproduced as Kim Marshall maintains copyright of image. **Please note- Copy of Black and White photo has Sepia tint. ***Prints are shipped within 3 buisness days of order and are shipped via USPS. Ships within US only. Outside US, email for shipping quote at josephsmithjr2009@hotmail.com. Many have speculated whether an actual photo of Joseph Smith Jr. was ever taken. Controversy has brewed over an 8" x 10" image given to the Library of Congress by Joseph Smith III in 1879 of his father. It is the opinion of some that this picture came from a painting and was not a copy of an actual daguerreotype. In contrast, many experts have said that it was indeed a real photo of a man with the image being artistically enhanced because of the limited capabilities of the enlargement process. ABC4's Joseph Smith Photo Mystery Solved? The Unedited Photograph of Joseph Smith Jr.